Diary of a Miner: Day 69: Oh dear... I'm slowly turning into a farmer! Day 69: Oh dear... I'm slowly turning into a farmer! I woke up with grand schemes set in my head! I really wanted to see if it was possible to get milk from the cows that were scattered around. I got up reasonably and set straight to work without breakfast! I could wait until later! I had more important things to do! I rummaged around in the chest, looking for some stone or something to dig stone out with. In the end, I found a small amount of cobblestone, and decided I could always get the rest from the nearby mine. That was something else I was going to do! I had found a portal down there, but apart from that, very little in the way of exploration had been done. Going outside, I set the cobblestone down in a pile and went off to the mine. As I walked, I saw a white animal sitting a few hundred metres away staring at me... Stopping, I looked closer and I could have sworn it was a wolf! Was it THEROS's? I couldn't tell; I was too far away to see any hint of a collar. Before I got the chance to get any closer, the wolf stood up and trotted away to the East. 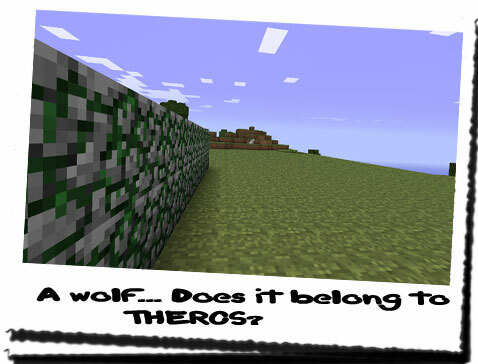 Odd... Had that wolf belonged to THEROS? It looked so familiar for some reason... It hadn't approached though... Maybe it wasn't. Casting it from my mind, I continued to the mine, with diamond pickaxe and bag in hand. I would only need a small amount of cobblestone to create a small base wall, and then finish the rest with a fence. Then I would put in a wooden door... Which Reminded me: I needed to go and chop some more trees down for lumber. I got to the mine, but instead of descending into it, I mined a small amount of cobblestone from around the edge. I had set myself a task, and I didn't really want to be distracted again. Putting the desired amount into my bag, I set off back to the house, following the path that lead round. I got to the house, tipped the added cobblestone onto the rest of the pile and chucked the bag to one side. I then proceeded to arrange the cobblestone in a rough wall shape before cementing it in place. 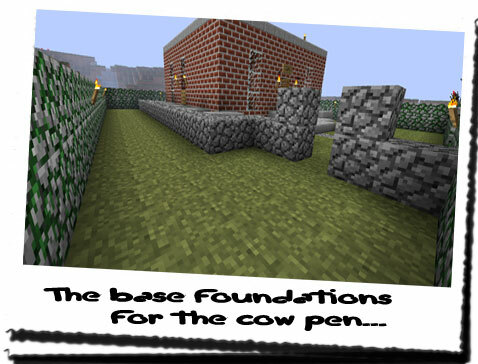 I had decided to maintain secrecy by putting the cow pen - not sure if that's the right word... - to the side of the house, but within the confines of the wall. That way the cow still had plenty of grass to eat and I had a better chance of keeping it hidden. 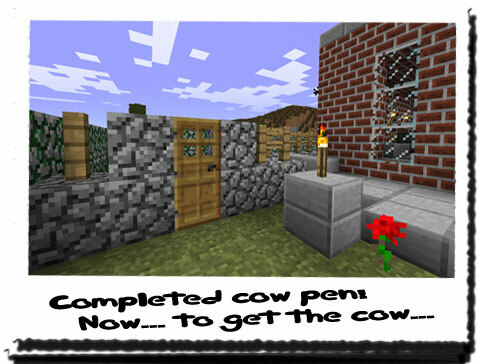 Keeping the cow away from the growing crops was also a high priority! After fastening the door to the wall, I went back into the house to get Chiron. When I found one, I would need his help in rounding the cow up in through the archway and then through the relatively narrow doorway. I also took two large clumps of solid iron with me. If it all went horribly wrong, I could always try to scare it into the right place by slamming these together. Going outside the wall, it wasn't long until I found a cow... In fact I saw three! Not wanting to get ahead of myself, I settled on one cow and began to advance. The whole time it stood there chewing constantly, not caring about how close I got... After I was close enough, I tried to get Chiron to go around to the other side and make it run towards me. Instead he ran towards it, barking like mad causing the cow to run off in the opposite direction! I called Chiron back, who did so reluctantly. He seemed to think it was all one big game, and using him was not a brilliant idea. I didn't really know what I could do except one thing. I walked around to the other side of the cow and called Chiron to me. The cow looked a little uneasy, but remained where it was. Telling to stay put, I walked a little to the right of the cow and began making noises with the iron clumps, whilst walking towards the cow. The cow began to move away from me until it was almost level with the house! Was this working? I couldn't tell, it was too soon. I brought Chiron back to me and then told him to stay put just to the left of the wall. I then went to the right and just behind of the cow and began banging the iron together again. The cow began to advance through the wall. This was great! It stopped just outside the steps to the house. 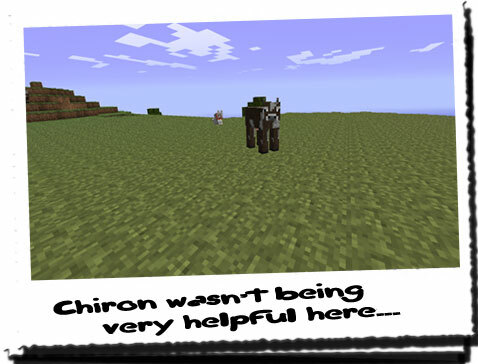 Once again I called Chiron to me, getting him to stay put just to the right of the cow. This would hopefully stop the cow running around to the back of the house. I then began advancing again banging the iron clumps, whilst driving it to the left through the door of the pen. At one point the cow didn't move and I thought I had messed up, but eventually the cow began to edge towards the door. After some louder bangs, I managed to speed the cow up and I closed the door once it was in. YES! I had a cow! Now I had access to milk... I hoped. Oh dear... Does this make me a farmer now...? I stood at the side of the fence looking into the pen, seeing what the cows reaction was. It didn't seem to mind really; it was already eating again, and the lack of wide open spaces didn't seem to bother it. However that was likely something to monitor over the next few days. Realising the cow would need water, I went into the house and took the bucket I had used to collect seawater. I then went over to the pool of fresh water and filled it up. On the return journey, I saw the wolf again. It was a little closer this time, but I still couldn't make out whether it had the same markings or a collar as the one THEROS owned...I placed the bucket down and began to walk towards it to get a better look, all the while it sat staring at me. When I was about one hundred metres away, it stood up and ran away to the West. I gave chase, but by the time I ran over to the hill it had sat upon, it was out of sight... That must belong to THEROS! Maybe THEROS was using his wolf to look for me... Alternatively, the wolf could belong to the guards, and they might be using it to find me instead! Worried at the possibility of this latter idea, I returned to the bucket and took it to the cow. I've been thinking about that wolf... It won't belong to the guards because they would have used one to track me by now. If they had, chances are I would be looking through from the wrong side of a cell door by now. I don't think it was a feral wolf because it wouldn't wait for me to get too close before running away. It would be instantly weary of my distance and would warn me, not just trot off... The problem was I couldn't see if it had a collar... If it had, there was a good chance it belonged to THEROS... Does that mean I'll be getting a new note within the next few days...?